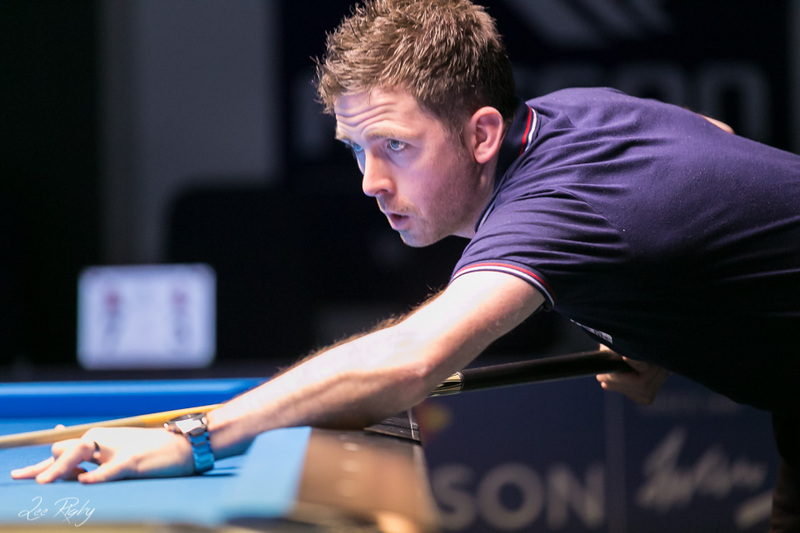 With the slightly compressed tour calendar this season, the UK’s pool players only had a few short weeks since the Paul Medati Trophy to either get over any disappointments, or carry through any momentum gained. With there being a slight twist to proceedings – 10 ball being the game played – it was a chance to play some high quality pool in perfect surroundings at the Park Inn in Telford. So 10 ball is generally considered a tougher game due to there being on average, more balls on the table to run out. The obvious extra ball comes into play but the rack isn’t as easy to make balls off from the break, leaving some tougher run-outs. Furthermore, as a call shot game there’s no fluking balls, so all this conspires to make a highly tactical game in many cases, and one which brings the power break and great skill further into play. The results overall reflect some of these changes, with less break and runs, and more hill-hill finishes than last month’s event. There were some very tense, tactical battles! In the early rounds Andrew John will have been kicking himself after leading the whole match against Can Ibrahim, but losing at hill-hill. GB9 Chairman in between helping run proceedings managed to multitask and play a bit of decent pool too, squeezing through against John Ward 9-8. And reigning Challenge Tier 2 champion Paul Taylor made a valiant attempt at holding elite pro Mark Gray back, but Gray pulled clear 9-5 in the end. Up and coming Scot Lee Creighton survived a final rack thriller with tour stalwart Andy Worthington, but came unstuck against Chris “The Ginger Ninja” Cowie. Cowie then took out another Scot in Chris Fraser, before bowing out against Kev Simpson in the last sixteen. Elliott Sanderson and Shane O’Hara treated the watching crowd to a high quality spectacle – with five break and runs between them, the game came down to just a couple of key errors by Sanderson. Sanderson then dropped to the one-loss side, where he faced a struggling World Champion in Daryl Peach. Peach however used his experience to send Sanderson packing, in what he will have seen as a disappointing exit – Sanderson still looking for his maiden Main Event title. In the final though it wasn’t to be for Imran this time, as Gray got his revenge. With his break working and three break and runs, the scoreline in the end was comfortable, and Gray celebrated a first Main Event win for some time now. A good time to find some form, with the UK Open in a few weeks time! So for all the form players in the Main Event who got to the last 16, the Super Cup awaited! With no easy games, it was Imran Majid who capped off a fine weekend overall with an 11-8 win over Tom Staveley in the final. Staveley in particular had looked impressive, showing he’s starting to mix it with the big boys. Three break and runs against ex World Champion Daryl Peach, and a 10-7 win over Mark Gray were standout performances, despite losing his first match to Craig Osborne. Mark Foster, similarly, also impressed getting to the business end of yet another tournament, taking out Stuart Colclough in convincing fashion, only going out to Staveley himself in the end in the semi-final. Michael Beeston, another very impressive form player this year, had a disappointing run, going down 10-6 to Chris Alexander and Shane O’Hara. No shame in those losses, but everybody wants to get their hands on the prize, and the cash! Chris Cowie had made a very solid run all the way to the Quarters, dispatching of Stuart Colclough hill-hill and Marcel Price. Osborne out-broke him though, and made light work of Cowie, in what was to be Osborne’s last win of the event. Majid was in imperious form, pacing around the table confidently. To make light work of Osborne was ominous for Tom Staveley, but he wasn’t fazed and matched him in the early racks. The long race and 10 ball rack however made for a challenge, and Imran’s experience shone through. Majid capped off his second place finish the the Main Event with none other than first place here in the Super Cup! Tier 1 of the Challenge was as competitive as ever, with Round 1 alone containing no fewer than four hill-hill finishes! Big guns Barry French, Alan Coton, Paul Dukes Thomas and Adam Stevens all heading straight for the one-loss side. Ryan O’Neill continued to impress as he has these last few months, with a convincing victory over Benji Buckley and the aforementioned Barry French. Damian Massey though was looking strong and finding some form and halted O’Neill, doing the same to Alan Coton, Neil Margossian, and Joni Holden. Paul Dukes-Thomas had a nightmare tournament losing hill-hill again, this time to Joni Holden. Benji Buckley however, wasn’t letting his early loss to O’Neill faze him, and rattled off wins via the one-loss side against Bradley Holt, Kurtis Weaver, Lee Creighton and Elliott Sanderson. Lee Creighton very nearly upset proceedings though, taking Benji to a final rack decider in the quarters, but it wasn’t to be for the young Scot. In the final, Damian struggled to get going and Benji raced to an early lead, and never looked back. Well done Benji! Tier 2 of the Challenge was full of thrills and excitement, and some fresher faces were making some waves. English 8-baller James Jack, starting to turn his attention to pool, had two early wins against Shaun Berrisford and Ryan Joe Lewis, and Rikki Hatherly looked in good early form against Gareth Pugh and Ryan Coton. Craig Seeney meanwhile was finding some form as well, finding some momentum in the one-loss side after an early defeat to Karl Hooley. He then went on a roll taking out Ed Fee, Kevin Rowles, Allan Brown and Can Ibrahim, to book himself a place in the hot seat. Meanwhile in the quarters, Mark Collins and Julian Roper found themselves in a tight battle that was as tense as it was popular to watch, with a crowd gathering to rival the interest in the Super Cup which was being played on adjacent tables! Roper, full of emotion, held his nerve in the final few balls in a hill-hill finish, and let out a scream as he sunk his final ten ball! Stephen Slater however was having other ideas – highly motivated and having targeted this tournament before the event, he held firm to hold his nerve in the second of two matches in a row that had gone to a final rack for Roper. In the final, Slater looked fired up and positive, and Seeney was struggling to bring the momentum he’d previously gathered to his maiden final. Nevertheless, Seeney made a game of it getting to five racks, but Slater too let out a roar of his own when he made the final ten – this one was never in doubt.